I have a mantra, a code, a mission statement to my life! And I am using it as my 'theme' to 30 Days of Agriculture! I first came across this 'saying' maybe 2 years ago - thanks to Agriculture Impressions and her shop on Etsy! It has become my favorite-it says exactly who I am (or strive to be) everyday! I have written it in the bean dust on my Explorer! I label pictures of my kids with it! I have it on the back of my truck! And when I turned my Dad's work belt into a cuff - well this only made sense. 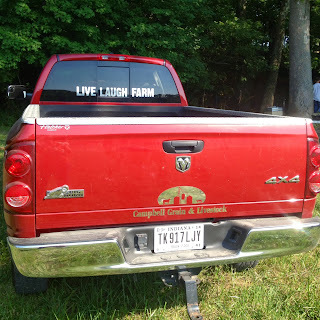 So the next 30 days tag along to LIVE.LAUGH.FARM with me!